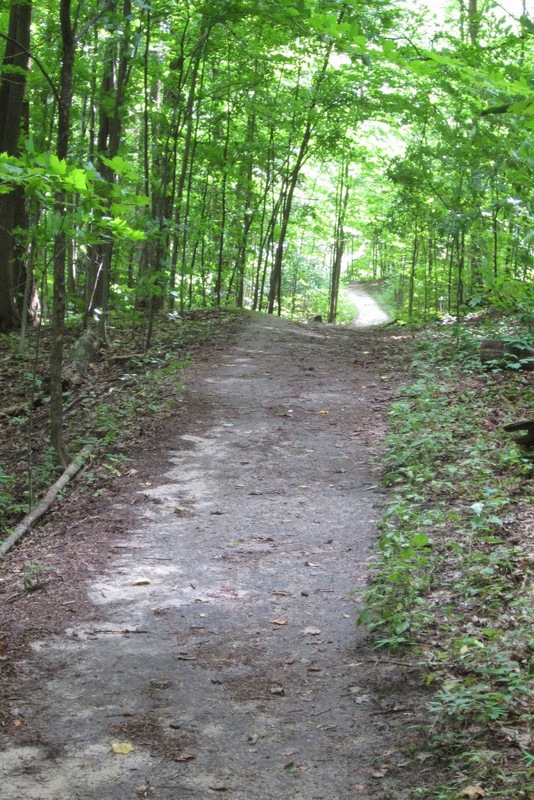 We picked a part of the trail close to the Hockley Valley Inn. It's always good to be near something quite civilized, as a reward for your efforts!! My husband had walked a side trail to the main trail in July, as part of his company's "off site," so we were in somewhat familiar territory. There are now so many side trails in sections of the Bruce, that you could spend days in one small area and never walk the same trail twice. It's amazing and it's all FREE - even the parking. 1. Made a packed lunch. 2. Packed the trail map and hiking poles - I managed to remember them this time! 4. I remembered to wear my FitBit, bring my phone - charged and my health card, plus an emergency credit card. If it's all free, then there is nothing to buy, right? Well you never know!! 5. Wore long leggings and socks. There are ticks (Lime disease) on parts of the Bruce. Also wore good walking shoes. 6. Packed my Canon Power Shot. My DSLR is just too heavy to lug around. 7. Read several road maps to find the location of the parking lot on an isolated side road off number 9 highway. 8. Packed bug spray - needed it. This is a very "hilly" walk with significant switch back climbs up the rises and fairly steep descents. If you're coming the other way, it reverses - no kidding :) We met a few people on the trail, coming and going - you are never really isolated. 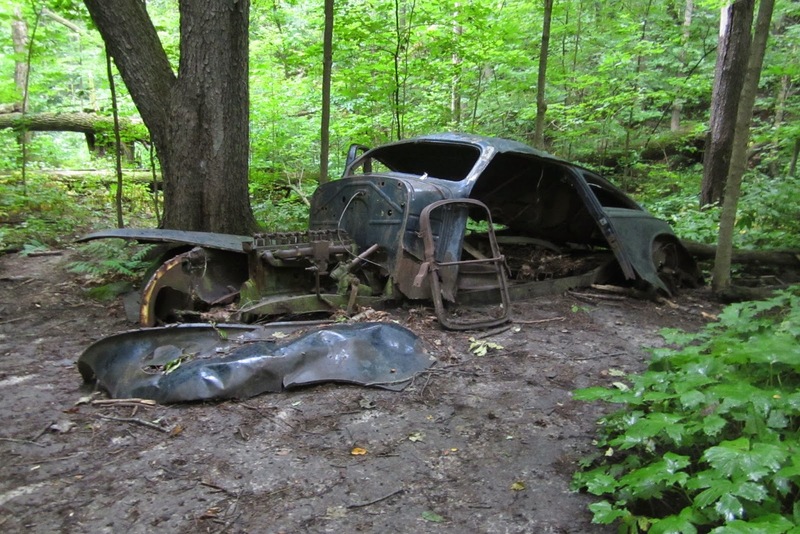 Though, it was very eerie to find this car wreck, at the bottom of one of the ravines. It must have been there a very long time and probably has a story attached to it. Close to the mid-point of the trail we stopped and had lunch on the only bench we saw the whole trip! 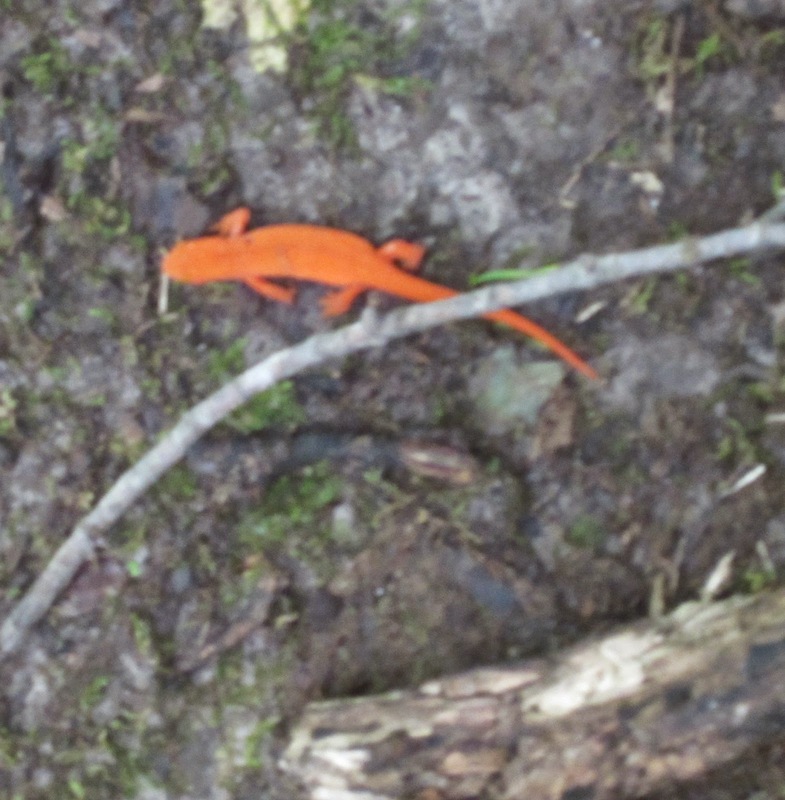 In total we walked 5.4 miles according to my fit bit and I would say that the highlight of the trail was seeing this bright orange lizard, and the fact that it really didn't rain. I would have liked to have shared a cheese plate at the Hockley Inn afterwards, but there was none on their menu, in spite of having a temperature controlled glassed in display case of some wonderful cheeses in the waiting area. They were also too busy with a wedding to notice some sweaty hikers, so we left and decided to pack our own cheese plates in a cooler the next time :) The Hockley Inn is a lovely spot and although they technically allow hikers on the part of their property that includes the Bruce Trail, they strongly discourage the walks, because the paths cross a part of their golf course. 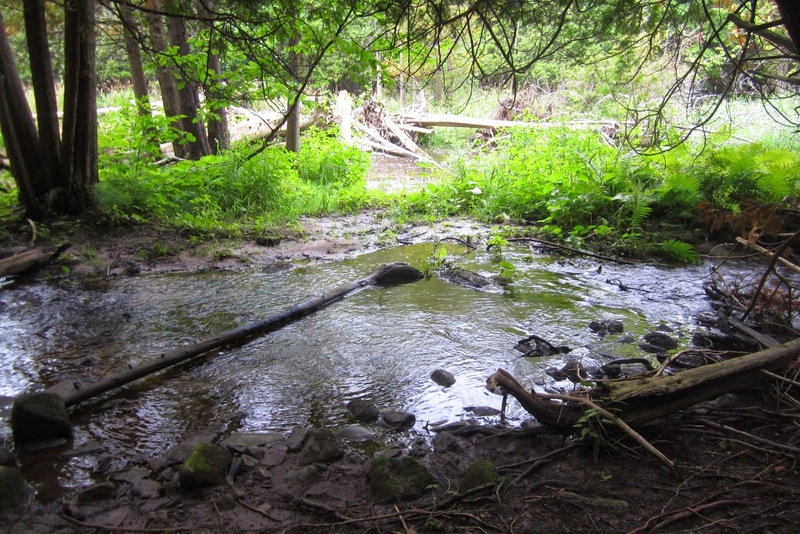 I would suggest that, if you book a room there and plan to hike, make sure that you can access the trail from the inn, before you book or else you will have to walk a mile or two on a very busy road before you even get to the trail!! For some, green really just means money!! 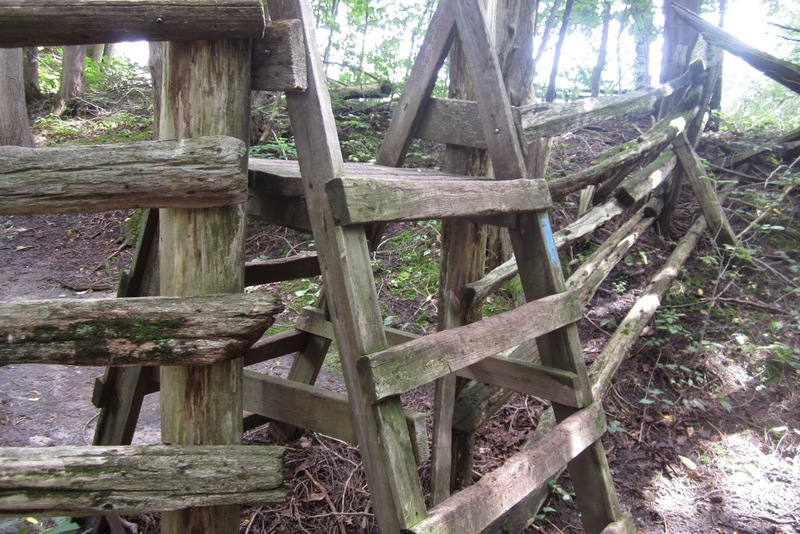 I am section-hiking the Bruce Trail and am looking forward to seeing that abandoned car when I get to that point. It sounds odd but I am fascinated with lonely and abandoned structures/places! Thanks for sharing. Am I my brother's keeper...? What will your verse be...?